Files with cmc suffix are in most cases special collection data files from the Comic Collector software. What is cmc file? How to open cmc files? File extension cmc seems to be mainly related and used for a special data format used in the Comic Collector, a comic books management and cataloging platform by Collectorz.com. 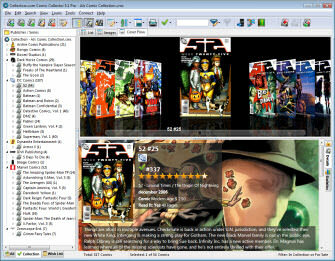 Comic Collector is a dedicated comics books cataloging software connected to Collectorz.com online comic database. It is likely that you can work with .cmc files only using Comic Collector. Comic Collector allows users to export their data, however, whenever this applies directly to .cmc files is not clear. and possible program actions that can be done with the file: like open cmc file, edit cmc file, convert cmc file, view cmc file, play cmc file etc. (if exist software for corresponding action in File-Extensions.org's database). Click on the software link for more information about Comic Collector. Comic Collector uses cmc file type for its internal purposes and/or also by different way than common edit or open file actions (eg. to install/execute/support an application itself, to store application or user data, configure program etc. ).